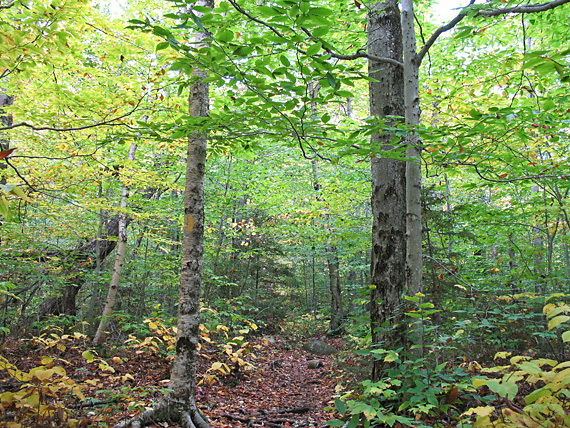 Early on the long road to proficiency in a craft or any serious skill, there are many mysteries to solve. In this first stage, there are countless individual elements that are difficult to master and all together they can seem overwhelming. 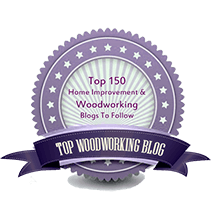 For example, the vast range of tools can be paralyzing for a novice woodworker, and to make matters worse, most new tools must be tuned or sharpened before they can even work properly. Gradually, each element is conquered and these early mysteries dissolve. Despite this progress, there is a growing feeling that, “I know what all the buttons do but I can’t get the thing to work.” In other words, the elements still must be synthesized – another set of mysteries to solve. 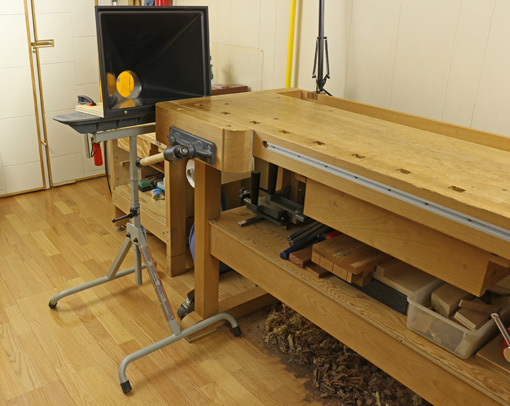 In this second stage, the developing woodworker who has learned to use all of the tools and make joints must still learn how to integrate many skills to actually make a piece of furniture. This is the big picture and it is becoming clear. Now you know what you are doing and you know it. You can really make stuff. With continued ambition, more practice, and, of course, a fair share of missteps and even disasters, you can make better stuff. There will always be lots more to learn but the big picture is no longer a mystery. After all of this comes a mystery of a different sort, an important one that is actually welcome and is meant to persist. The skillful person is now doing some things without being cognizant of why, at least at the moment, yet the moves are very right. It is as if the program, so to speak, runs on its own – not always, but at least during some of the most productive times. Call it instinct, flow, intuition, grooved neural pathways, or just a lot of plain old practice, but there is indeed a wonderful mystery to it. Sure, this happens during some days or hours and quite disappointingly not during others. Moreover, some flights of supposed brilliance could be very wrong, though that is a risk hopefully worth taking. Watch the great soccer player Neymar. He is surely not aware at the time of exactly how he makes split-second moves on the field, and even afterwards probably cannot fully explain his mental processes. All the studies and data in the world will never fully supplant the instincts of an experienced medical clinician or a financier, each faced with the unique specifics of a case at hand. A craftsperson’s hands seem to have mind of their own. A very good every day driver may save his life with a moment of prescience, and NASCAR drivers probably do this all the time. A good teacher knows with a sixth sense how to reach each student as an individual. Most wonderfully, a refined creative sense tells us that when it feels right, it is right. So OK, this is a very good place to be but what of use can be said about it? After all, it is a difficult matter to deconstruct. Certainly, reaching this level is not easy and requires time, practice, and talent. I think most important is the realization that this level of functioning cannot be borrowed or directly taught. This form of doing something truly well must arise uniquely within each person after the first two stages have been taught and learned. This happens as you train, practice, and confront the expanse of your freedom with courage. This learning grows in the quiet moments of concentration when persistence seems inevitable and you trust yourself even if the effort is uncomfortable. With humility and some luck, mastery may be ahead. Corner blocks (corner braces) are a practical, effective way to strengthen furniture, particularly post and rail assemblies. 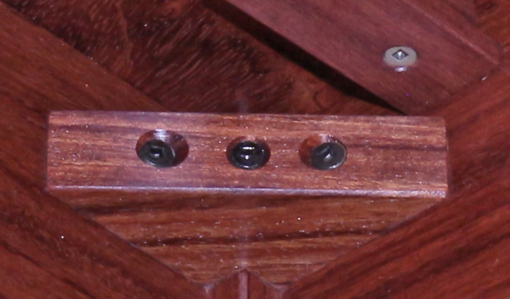 As previously discussed here, a properly designed and executed mortise and tenon joint will itself rarely fail but the wood around the mortise still can break. Two feet of leg extending below a table apron can impose huge leverage on the wood in the area of the joint. Corner blocks are routinely used by chair makers but it surprises me when they are absent in tables where they could have been included. I use them whenever possible – belt and suspenders. Of course, sometimes there is no room for them, such as when a drawer is in the way, and sometimes they would disturb the appearance of the piece. The different mechanical stresses involved in casework make corner blocks generally less useful but there too they are still probably underutilized. If the table aprons are at 90°, it is easy to make corner blocks with the table saw and miter gauge. The long side of the triangle could be as little as 3″ for a small table and 4 – 5″ or more for larger work. For thickness, 1 – 1 1/4″, using a single row of screws, is usually enough for small to medium work, though for large pieces, 2″ or more with a double row of screws is more in line. I make corner blocks with a notch to accommodate the inner surfaces of the leg. I think it is best to leave a tiny gap between the block and the leg to avoid possible problems with wood movement that might affect the tenon shoulder line. However, in the past I have not always made a gap there and that has not caused problems. If the aprons are not at 90° or are curved, I find it easiest to place a blank of wood diagonally spanning the aprons and simply trace the inside edges of the aprons and leg onto it, provided the top of the legs and aprons are flush. Then I bandsaw to the lines and, if necessary, refine the result with a plane. Alternatively, one straight cut, if required, could first be made on the table saw and used as a starting alignment. If the legs extend beyond top of apron, measure out and cut a notch, then place the blank and trace. Another approach that is sound, though not my preference, is to make the block span the aprons but completely clear the leg. This sacrifices some glue area but should still be sturdy enough and seems easier to make. Prepare the block by drilling and countersinking clearance holes for the screws. The center hole for the screw that will penetrate the leg is at 90° to the long edge of the block. I make the holes for the screws that will penetrate the aprons at 75°, not 45°, to the long edge of the block so there will be a good bulk of wood around the clearance hole. This also allows a little more screw length to penetrate the apron. The blocks in the photo above show the features discussed. I glue the blocks in place with Nexabond 2500M CA glue after sizing the end grain for about one minute, or similarly with quick set epoxy if the sawn surface is at all rough. After the glue sets, I drill pilot holes into the legs and drive those screws. Then I reset the masking tape depth stop and do the same for the apron screws, being extremely careful not to drill too far into the aprons. If there is room for only a thin corner brace that cannot support a screw, a dovetailed attachment to the top of the aprons could be used. 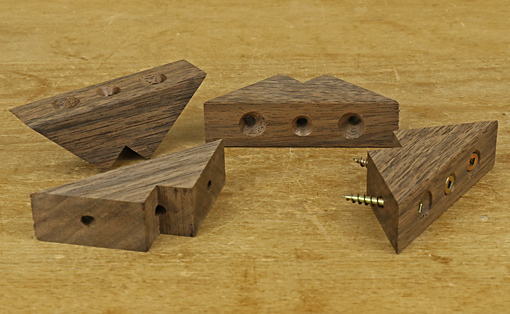 Otherwise, dovetailed attachments are difficult to make and unnecessary. My small shop requires making efficient use of every bit of floor, wall, and air space, including for dust collection. The setup described here has proven convenient and effective. The Oneida Mini Gorilla is set on the “mobile” stand but since it will not be moved, I took off the wheels and attached wooden blocks under the platform (see photo above) to save a little space and make the assembly more stable. The whole thing is tucked away just to the right of the table saw, with the filter facing mostly away from the interior of the shop. Using a 5″-4″ reducer, I attached a 4″ flexible plastic-wire hose to intake port of the collector. This type of hose, available from Rockler, Woodcraft, etc., is durable and easy to handle. A 5″ hose seems more awkward to handle and the 4″ certainly handles all of the chip production from my machines, as discussed in the previous post. It also meets the requirement specified by the manufacturer for airflow through the filter. I simply bring the hose to each machine as needed, which is very quick to do. The default location is attached to the table saw and with some of its length curled under the saw’s motor hood. 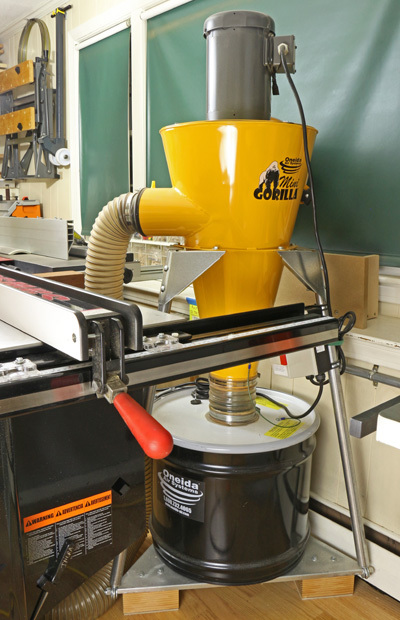 Each machine – table saw, bandsaw, jointer-planer, router table – and a dust hood accepts a simple press-fit plastic female connector that is attached to the end of the hose. The ports on some of the machines required modifications for the hose connector to fit uniformly on all of them. 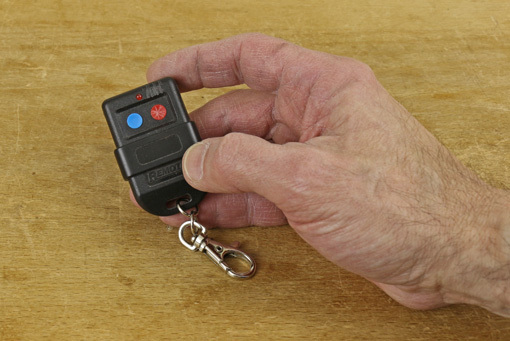 The remote control is very handy, almost a must. It works by radio frequency, not infrared, so no optical line of sight is required. The steel collection drum holds 17 gallons. I empty it into a 45-gallon trash bag, which makes the job easy. Smaller trash bags made the job considerably more difficult. It is fairly tight quarters getting the drum off and back on the machine but not a big deal. I would have bought the super deluxe infinite capacity drum at an untold price but, um, I was told these have been banned because they defy the laws of physics. The Mini Gorilla can also be ordered from Oneida with a wall mount bracket. This would not have worked out in my shop but you may want to consider it. It allows the use of a 17, 35, or 55-gallon drum, while the mobile stand is limited to the 17-gallon drum. 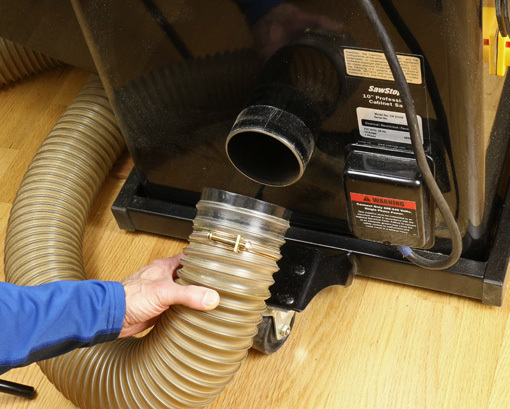 Now the steel drum is, of course, opaque, and if you let it fill up such that dust gets backed up higher into the system, you will have a very unpleasant time cleaning the pleated HEPA filter. I made this mistake – twice! 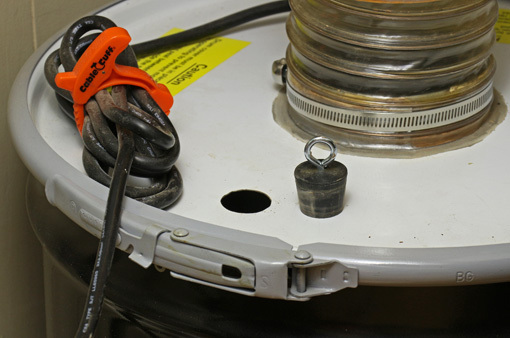 A drum level sensor is available from Oneida but my solution was to drill a hole (approximately 1″ in diameter) in the lid and block it with a rubber stopper with a screw eye handle. When my guardian angel taps on my shoulder, I check on the bin by removing the stopper and peering in with a flashlight or just inserting a rolled up piece of paper or dowel as a depth gauge. It works. The Mini Gorilla motor can be wired as 110V/16A or 230V/8A. I run mine on a 110V/20A circuit with a dedicated outlet. Keep in mind the collector draws a lot of juice and there will always be another machine running with it, so check your electrical capacity and outlets. 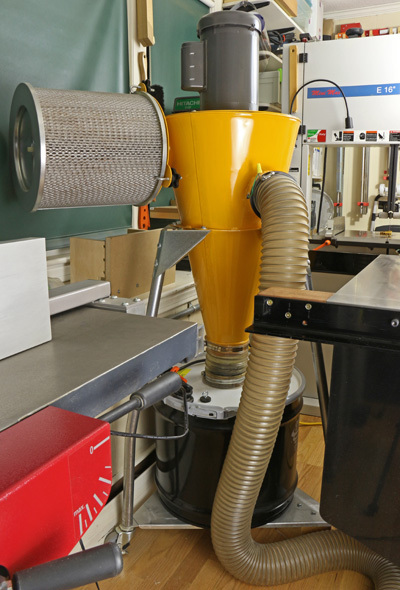 The dust hood shown below clamped to an outfeed stand is helpful at various locations, especially for the storm of debris produced by router mortising with an upcut spiral bit. By the way, the shavings under the bench are just fine for a while where they are, without a dust collector.